Skye Gravestones | Mary (Macinnes) & John Nicolson & family. Mary (Macinnes) & John Nicolson & family. 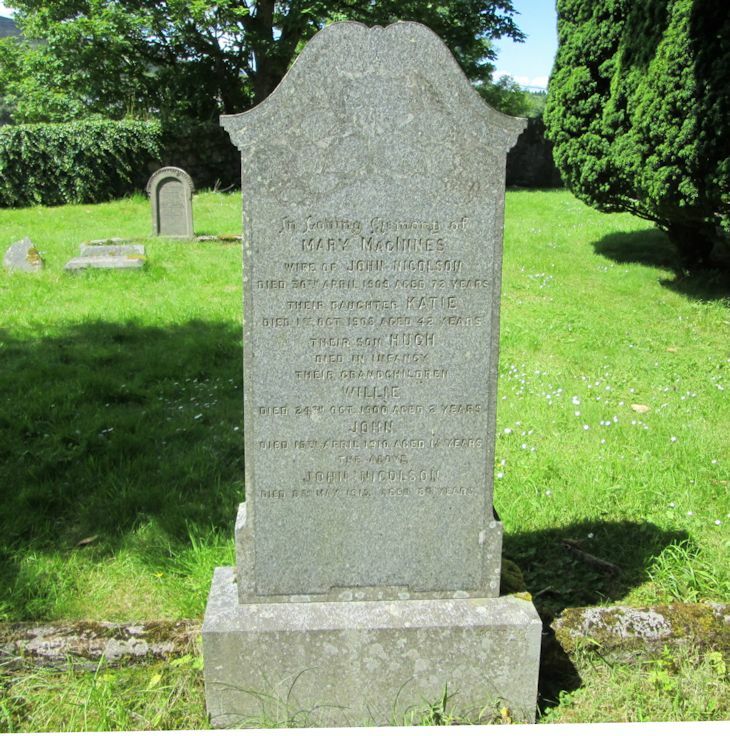 In loving memory of/MARY MACINNES/wife of JOHN NICOLSON/died 30th April 1909 aged 72 years/their daughter KATIE/died 1st Oct. 1908 aged 42 years/their son HUGH/died in infancy/theit grandchildren/WILLIE/died 24th Oct 1900 aged 2 years/JOHN/died 15th April 1910 aged 1½ years/the above/JOHN NICOLSON/died 8th May 1915, aged 88 years. Picture Added on 23 August 2014.